Congratulations to Middle School Geography Bee winners. L to R: In First Place was Styrling Murray (8th Grade); the Runner-up was Charlie Goldsmith (7th Grade). 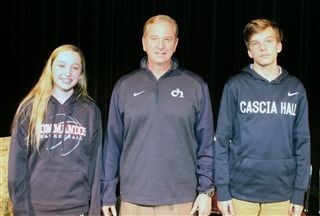 They are pictured here with Mr. Todd Goldsmith, Middle School Principal.